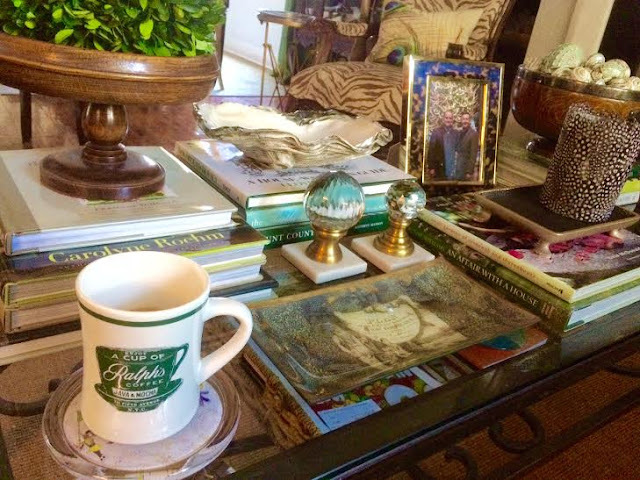 Once the Mardi Gras decor was put away, I decided to change the vignettes on the den coffee table. I love to start with stacks of decorating books. I chose the books in shades of green. 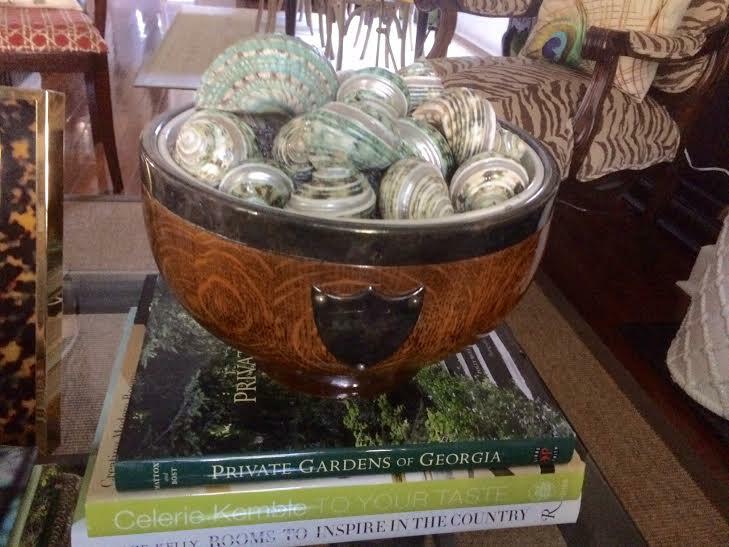 The English oak bowl filled with shells is a find from The Plantation Shop, Amelia Island. I picked up tortoise inlay and brass Aerin Lauder frame on our recent New York City trip. 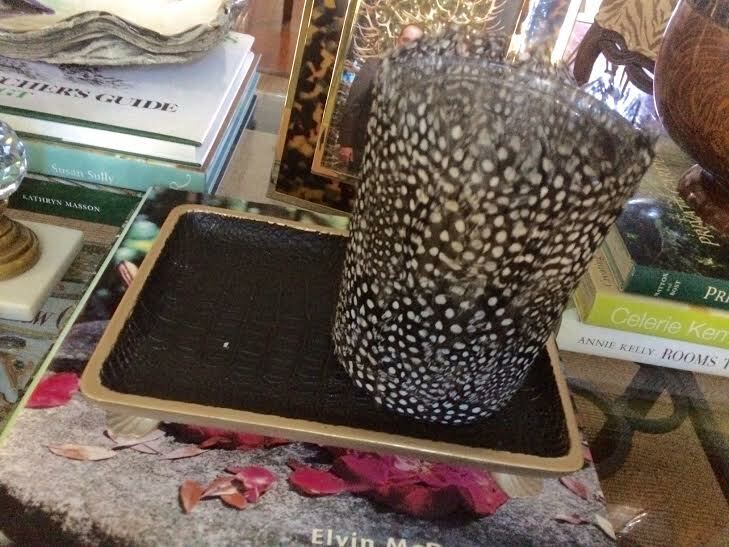 A catch-all crocodile tray and feather candleholder from Abode fit nicely with the natural look I love. 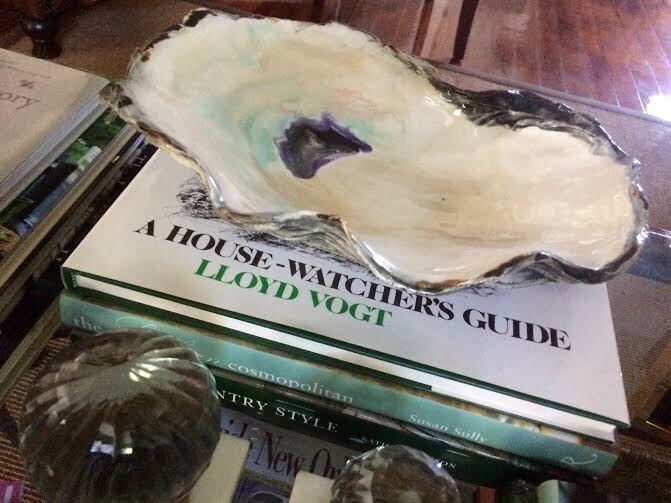 No coffee table design at my home would be complete without an oyster shell. A SeaGem Studio oyster bowl adds to the coastal vibe. Two brass and glass balustrade newel post ornaments on marble were purchased from an Atlanta fave, Hill Street Warehouse. A Laurel Wilder tray from Hazelnut holds the remotes. A boxwood sphere and English oak stand also lend a natural feel to the table. 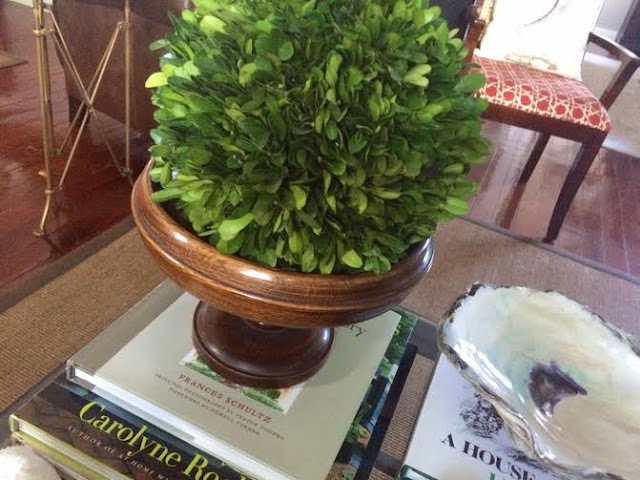 I love to rearrange the coffee table from season to season. It is easy and can be changed on a whim. Lovely post. 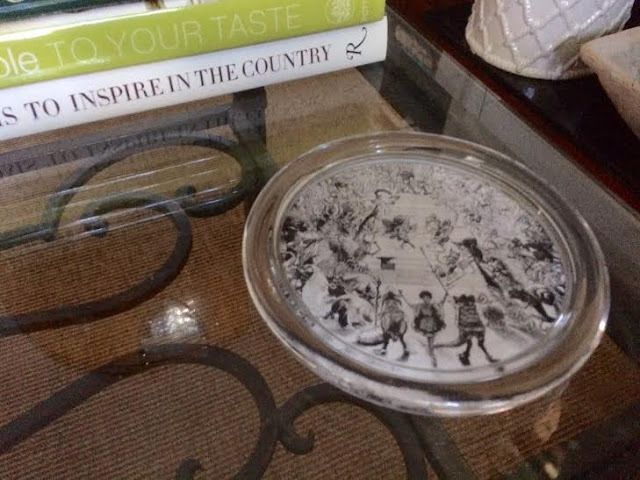 Each item is a jewel on your coffee table. Would you mind sharing where the Ralph coffee cup is from? Would love to gift one to a friend of ours (named Ralph, of course). Thanks. 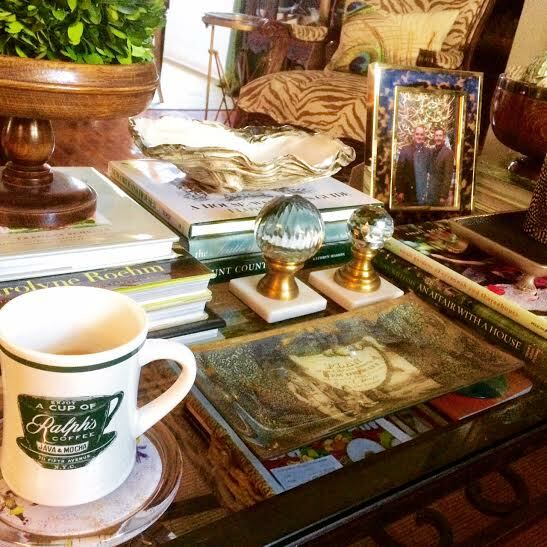 Jayne, the Ralph Lauren mug is from Ralph's Coffee in NYC housed in the Ralph Lauren signature store on 5th Avenue. I love it too. We are all about hearts and flowers here. :-) Love the red of February! Love that Oyster shell, Ron. Excellent job Ron! I love to stare at tables with lots of goodies like this. 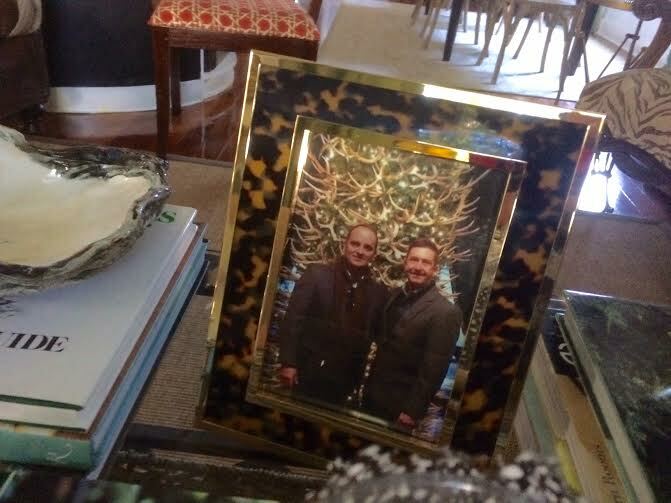 Love that new frame especially since you put a picture of you two from your trip in NY. My daughter is there right now and had a date last night- can't wait to hear about it! Can you believe I've never been to NY, NY?? Love those crystal finial pieces (I tried to find some on the internet but no luck so far).